After the Virginia football team opened practice Friday, reporters pulled aside Bryce Perkins as expected. The starting quarterback, after all, is always in demand when it comes to media opportunities and with Perkins securely in that role as camp opens, people wanted to his hear his thoughts on the start of preseason practice. Perkins said the first day had some ups and downs, but overall the offense showed some good things on the first day. There in the middle of that answer, however, is something that caught my ear. The “99 Virginia Football Thoughts Before Kickoff” series continues. During Perkins’ thoughts on the first day of practice, he singled out junior receiver Hasise Dubois as making some great catches. In the offseason, Olamide Zaccheaus and Joe Reed have dominated the discussions surrounding the receiver position. Understandably. Zaccheaus set the program’s single-season record for receptions with 85 last season, while the coaches routinely have expressed the hopes of getting Reed more involved on offense. The Cavaliers need players to emerge beyond those two, though. That’s because the offense lost two productive seniors that played a lot of snaps in 2017. Doni Dowling and Andre Levrone each surpassed 600 yards receiving last season. As discussed earlier in this series, one of the big questions for the upcoming series is replacing the downfield receiving threat Levrone provided. He averaged 42.14 yards per scoring reception on seven touchdown catches last season! Plus, he made the go-ahead touchdown catch against Georgia Tech in the game that secured bowl eligibility. Levrone ended up with 35 catches for 689 yards and seven touchdowns. The Hoos also lost a lot of production from Dowling’s spot, though. He ranked second on the team in receptions with 50 and tied Zaccheaus for second on the team with five touchdown receptions. He had touchdown catches in four of the team’s six wins with one in each game against Connecticut, Boise State, and Georgia Tech. He hauled in two scores against Duke. That came on the heels of the 2016 season when he led UVA with 626 receiving yards. That’s a lot of production over two seasons. Enter Dubois. At 6’3” and 215 pounds, he’s a physical presence that can make some of the possession type catches that Dowling did for Virginia. Plus, he’s a potential target on shots to the end zone as well. With that said, he hasn’t always created clean separation with route-running and through two seasons, he’s totaled 24 catches for 219 yards with one touchdown. That included eight catches for 99 yards as a true freshman in 2016 and 16 catches for 120 yards last season. Still, something is potentially brewing with Dubois entering 2018. Remember, Dubois ended spring practice with a leaping touchdown grab that gave the offense the win against the defense in the final scrimmage. That pass came from Perkins, who mentioned his name again as preseason practice opened. That’s enough to think that there could be some chemistry developing between Perkins and Dubois. Is a junior jump in the cards? (The same could be asked of Reed, who had 23 catches for 244 yards and 2 TDs as a sophomore). It’s not uncommon at Virginia in recent years. Here are some examples from recent seasons where a junior receiver emerged to be a key part of the receiving corps. In 2011, Tim Smith put together one of the best seasons of his career as a junior with 33 catches for 565 yards and three scores. He had 204 yards as a freshman in 2009, but an injury limited him to just two games in 2010. That set up the big bounce-back year as a junior in 2011. 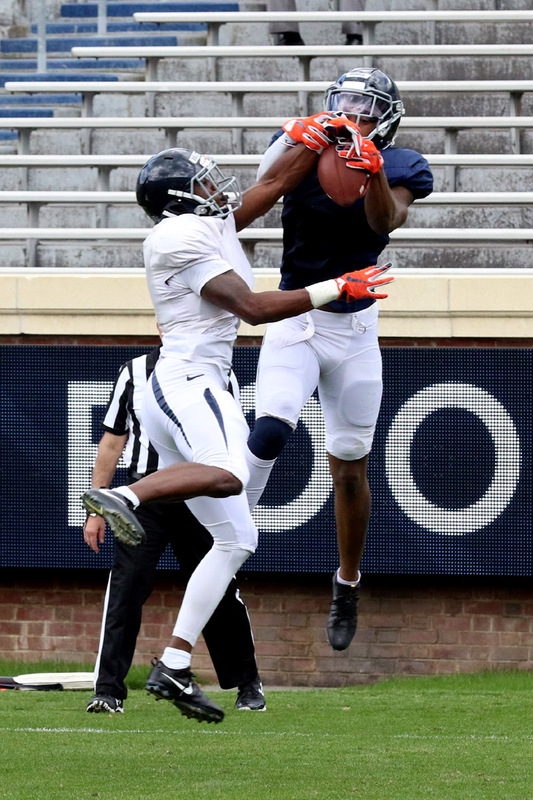 In 2014, Canaan Severin emerged from out of nowhere to become UVA’s leader in receptions with 42, receiving yards with 578, and receiving touchdowns with five. Prior to that season, Severin had made just six receptions for 46 yards. He followed that up with a big senior season too (54 catches, 759 yards, 8 touchdowns). In 2016, Dowling secured 50 catches for 626 yards and four touchdowns. Dowling had made 14 catches for 141 yards as a freshman, but a knee injury limited him to just three games in 2015. The fact that he came back to lead the team in receiving yards as a junior came from off the radar. Two other receivers picked up their production going into their junior season too. In 2010, Kris Burd nearly doubled his receiving yards from the previous year with 799 and added five touchdowns. In 2017, Zaccheaus took his game to a new level with 85 catches, 895 yards, and five touchdowns. That followed a 51-catch, 584-yard sophomore season. Zaccheaus is an interesting case when thinking of Dubois. Despite that solid statistical season as a sophomore, Zaccheaus said entering last season that the coaches had challenged his maturity in the spring’s exit interviews between the 2016 and 2017 seasons. He responded obviously with a monster junior year. Are we seeing the first signs of Dubois’ response to the challenge early in preseason practices? Will he make a junior jump in a year where the Hoos need receivers to step up? Kickoff is drawing closer.